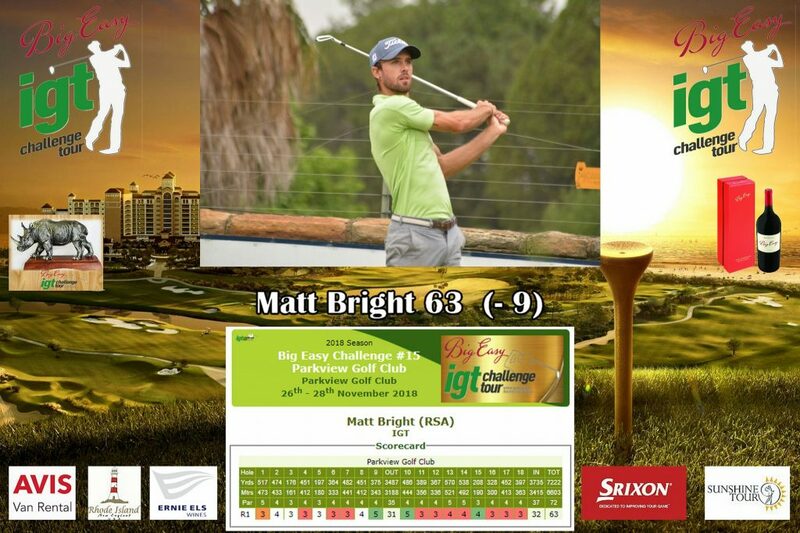 JOHANNESBURG, 26 November 2018 – Reigning Race to Sunshine Tour leader Matt Bright produced seven sensational birdies on the home stretch at Parkview Golf Club to charge to the top of the first round leaderboard in the Big Easy IGT Challenge Tour #15 on Monday. 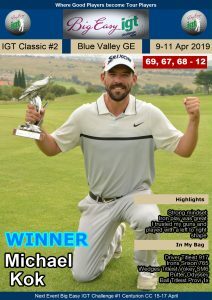 Going in search of his third victory this season in the penultimate event, the big-hitting 25-year-old year old Sandton golfer put on typically strong display of excellent ball-striking for a brilliant nine-under-par 63 to finish the day two shots clear of Thriston Lawrence. 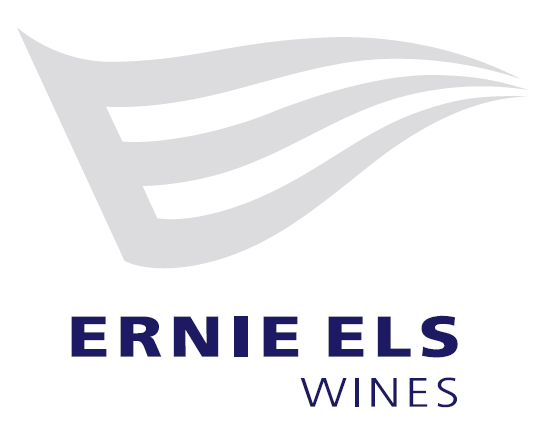 The Sunshine Tour rookie eagled two par fives – one and 14 – and cancelled a lone bogey at seven with a quartet of birdies at eight, 13, 16 and 18. 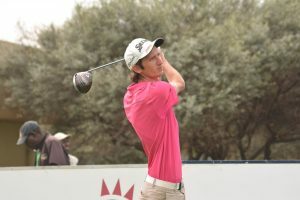 Seasoned campaigner Jeff Inglis returned a flawless six-under 66 to sit three off the pace in third. 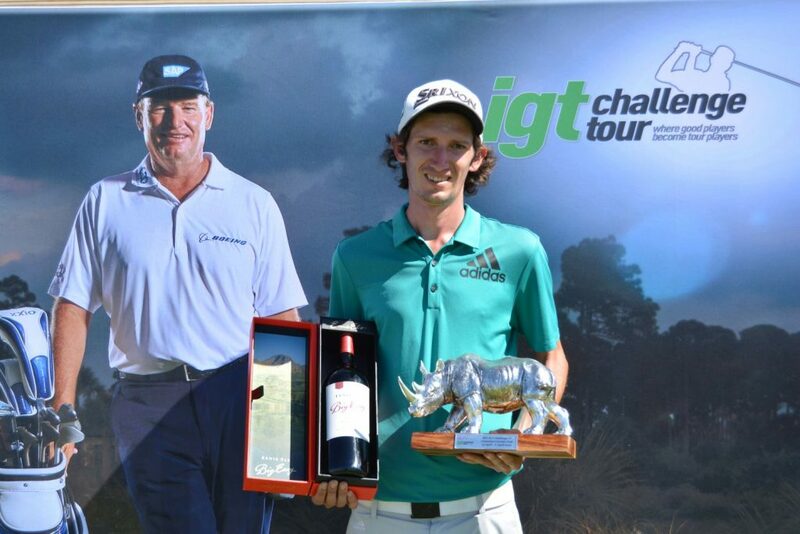 IGT Challenge Tour winners Tokkie van den Berg and Kyle Barker a further shot adrift in joint fourth, while Gary Player School of 2018 members Makhetha Mazibuko and Thabang Simon went around in rounds of 68 to tie for sixth with Italian amateur Giulio Castagnara, Big Easy IGT Challenge Tour winner Stuart Smith from Botswana, IGT Challenge winner Louis Albertse, Sunshine Tour golfer Matthew Spacey and last year’s IGT Challenge Tour Money List winner Ruan Conradie. 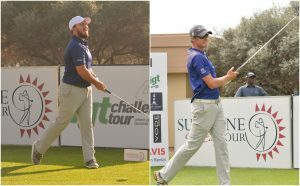 A further six players finished at three-under, while last week’s Sunshine Tour Qualifying School First Stage winner Tristen Strydom leads the 15-man challenge at two-under. Forty-four players in the starting field of 109 managed to finish in red numbers, but none could match the masterclass from Bright. 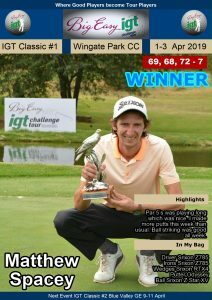 “It was a combination of soft greens and good ball-striking,” said the young entrepreneur, who splits his time between running his steel manufacturing company, Steel Stuff and competing on the Big Easy IGT Challenge and IGT Challenge Tours. “The recent rain softened the greens, leaving them quite receptive and I really struck the ball well. I only missed three fairways and two greens and I made a lot of putts inside 10 feet. Bright hit both his approaches at 11 and 12 inside three feet and birdied both par fives, 13 and 14. “I hit my tee shot in the greenside bunker left on 15, splashed out to six foot and missed the par putt,” he said. “The 16th is a driveable par four and I took advantage. “At 17, I hit a solid drive down the middle, a wedge to 15 foot and holed the birdie putt. I took hybrid off the tee at 18, hit a lob-wedge to three foot and made the putt for the last birdie. It was some of the best golf I’ve played this season and the timing is good.